its been a few weeks since I last wrote a post that was covering life in general. I’m starting to focus on healthy eating for the kids, hair updates and reviews of things I’ve been sent. I’ve found a rhythm of regular blog posts and am starting to forget to right down my thoughts on everyday life still, I’m loving discovering recipes and kids friendly, healthy meals and puddings that I’m trial and testing and sharing with you guys. I think I’ve said this sentence in every ‘wrapping up a month blog post’ for the last 3 maybe? but I’m going to say it again, how quick is October going?! I cannot believe that in less than 2 weeks time I have to get my arse in gear and do some proper Christmas shopping. I’ve picked up some little bits for the kids this last month or so but the bits I’ve got are only stocking fillers! think it’ll be time to sit them down in front of a catalogue sharpish. the past few weeks have been manic for me, Connor’s settled into school life perfectly. You can read all ab out his first week of school here. we’ve found the routine together and its all kind of fallen into place. the only thing I find annoying about school is how involved us parents have to be?! its ok if you’re a stay at home parent but I work! my job keeps me sane and if I was a stay at home mum I would 100% help out up the school all the time but the fact is I can’t. I don’t have the bloody time! other than that its all good, his teachers are lovely and Connors really enjoying it. we’ve been on holiday this month which was brilliant! we went with my mum in the end as I needed some peace and quiet and time to get my thoughts together. all couples argue and I’m not ashamed to say me and Luke bicker sometimes but unfortunately we hit a brick wall in our relationship. we have been together for so long 6.5 years. its such a long time and we know each other inside out! we both needed to take a break and have a week apart to figure out where we go from here and I think it did us good. there’s so much love there and I think anyone who knows us would agree you can see it in us, but somewhere along the line we got a bit lost in the upcoming weeks to our holiday but its ok. never be ashamed to admit you’re struggling because if all of us kept it to ourselves then nothing would ever be resolved. how can someone fix something they’ve done or not done if they don’t even know they’ve been doing it?? the important thing is that we are working on it and trying to piece it all back together. I think you always get that couple of people who claim to have the perfect relationship and reality is there’s no such thing! if you love each other you work at it and continue too for as long as you can! Anyway In lighter news Halloween is coming up and in our group of friends I’ve offered to throw the first Halloween party out of all of us! I’m actually really excited I’ve got so many ideas and ordered so many things and cant wait to start cooking and baking! so keep an eye out for blog posts coming all Halloween inspired in the next couple of weeks! I’ve also asked my friend who is a personal trainer to do little guest post on keeping fit and keeping your kids fit so that will be coming soon too! I’m in 2 minds for Christmas, one part of me is so excited already. getting the tree out, everyone being a little bit more jollier, the kids excitement and the family gatherings not to mention all the festivities. but the other part of me wishes i lived in a tropical country so i could wear a bikini all through Christmas! i think we all like the thought of getting out all our winter clothes, big baggy woolly jumpers, early nights and the heating on. when in reality all we do is moan how cold it is and how expensive our gas and central heating bills are!! we are a funny bunch, us brits are never truly weather happy I don’t think. Today (sunday) ive spent the afternoon making Connors first school project. He was sent home with this homework just before we went on holiday so we had limited time to do something cool so I had to think out the box! Connor had to do a collage or something that displayed fruit or veg, his favourite fruit or veg (Connor hates both sorts) or take pictures and display them of fruit or veg! this is what we came up with….. 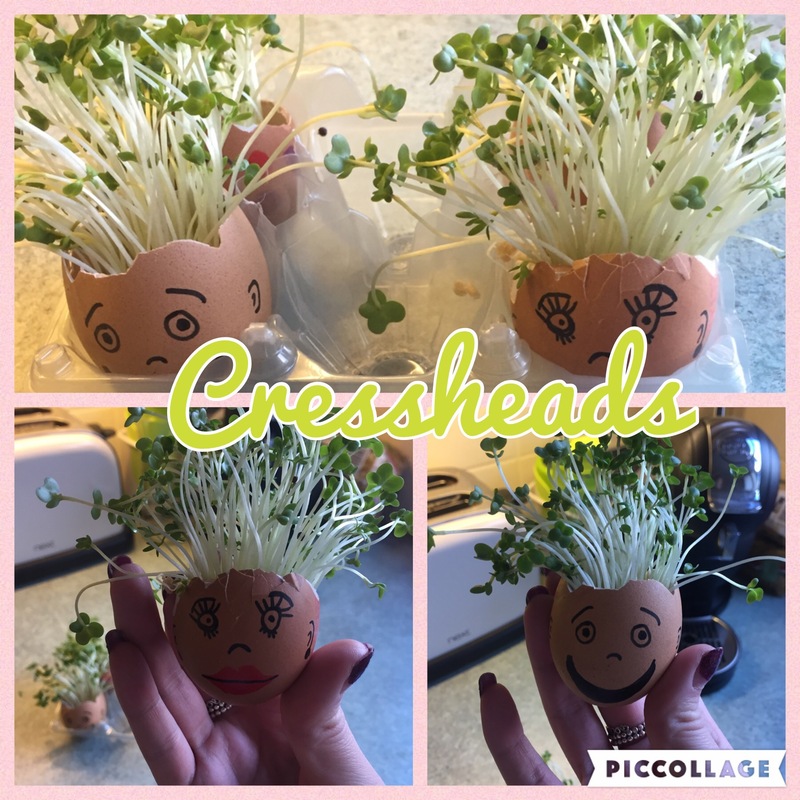 I thought we would grow some cress, obviously its salad veg that came from seeds, put them in some empty egg shells and make them into cressheads!! I cut up the egg container so connor can carry them into school tomorrow and then I wrote describing what we did from seeds to plant! I’m not going to lie I’m pretty proud for thinking of this! so move over kids with little paintings, we have smashed the first project!! can you tell I’m a bit competitive?! id like to say the last couple of months of 2016 are hopefully going to be relaxing and calm, no rushing about or taking too much on but I know that wont happen! I’m the queen of doing too much but I love to be busy! my priorty is now to make sure we all have a great Christmas!! if you enjoyed reading my update on October you might also like to read Mallorca, it’s been lovely…. and catch up on our holiday! Next My top 5 hot buys of September!